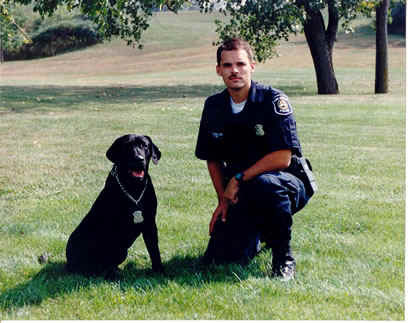 Police K9 units are sometimes the unsung heroes of law enforcement. Most people don’t know much about them, except the fact that these chosen patrol officers have a four-legged partner instead of a human partner. And of course, the fact that these partners can stop and bite the bad guy or find hidden drugs, explosives, or lost people. There are definite positive aspects to having a canine as a partner. They don’t have a bad day, complain about a spouse or relationship, or have any personal problems that could hinder their job performance in the line of duty. It takes a strong, driven person to train with police dogs. You must have an understanding of dogs in general and know the limitations of the task you’re undertaking. I had the wonderful and amazing opportunity to train with the local K9 in my area for scent work. I remember the first time I brought my dog into a large warehouse building to search for narcotics. We had already trained in simulated, controlled scent searches. Now this time, I had to find (or rather my canine Trucker) had to find the hidden drugs. It was a huge building. I felt overwhelmed and quite small in the scheme of things. The trainers and police officers watched. That was a lot of pressure for me – I could feel their eyes on the back of my head. I wanted to be able to handle the exercise just like the “big” police guys. My hands shook and my legs felt a little rubbery. As I looked to my dog, he knew exactly what to do. I unhooked his leash and gave the command “search”. My dog took off, a big circle around the warehouse. He then confined his search into a grid pattern, systematically sniffing. I could tell that he got a scent and he was just honing in on the exact location. My heart pounded. I tried to move into the building casually, but I was holding my breath. Within three or four minutes, my dog began to get excited at an old cupboard. He sat, which was his passive alert. His eyes were bright, energy was high, and he knew that there was a find. I opened the cupboard door and gave the command “search” again. My dog touched his nose in the area and sat. I turned and looked at the trainers that we had a find. They all had big smiles on their faces. What a great day! In Silent Partner, hero Deputy Jack Davis along with his partner Keno, have to be at the top of their game at all times. They come in contact with murderers, homeless people, victims, arrogant other cops, old friends, good times, betrayal, lies, deceit, and yes of course thrown into the trail of a serial killer. Readers will have the opportunity to see into a modern day police K9 unit world. It’s guaranteed to be exciting and entertaining. Jack is a kind, considerate person with a heart of gold, but has the strength and tenacity with the law on his side. He gets pushed into making some tough choices that will change his life and how he perceives the police department. Each day is a choice for him and what choices he makes may surprise you. Keno, bright eyed, intelligent, loyal, will have you cheering in several places in the story. What better partner to have your back than a top police dog? Keno adds another interesting dimension to a cop thriller. Check out Silent Partner, available in paperback and ebook formats. This entry was posted in K9, Silent Partner and tagged author and criminologist jennifer chase, author jennifer chase, crime fiction, Jack & Keno, k9, silent partner. Bookmark the permalink.